As some of you can guess by the fact that I’m posting blogs again, I’m mostly recovered from our big end-of-year fundraiser, followed by the holidays. 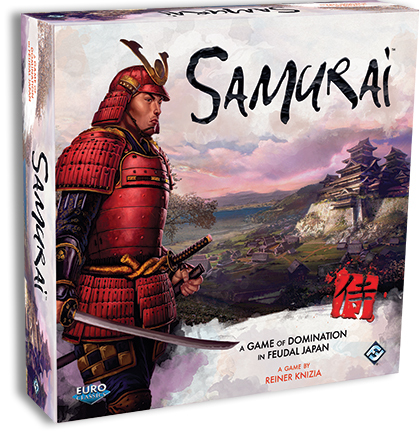 What’s more, the Worldbuilders team has recently finished shipping out the last of this year’s prizes. 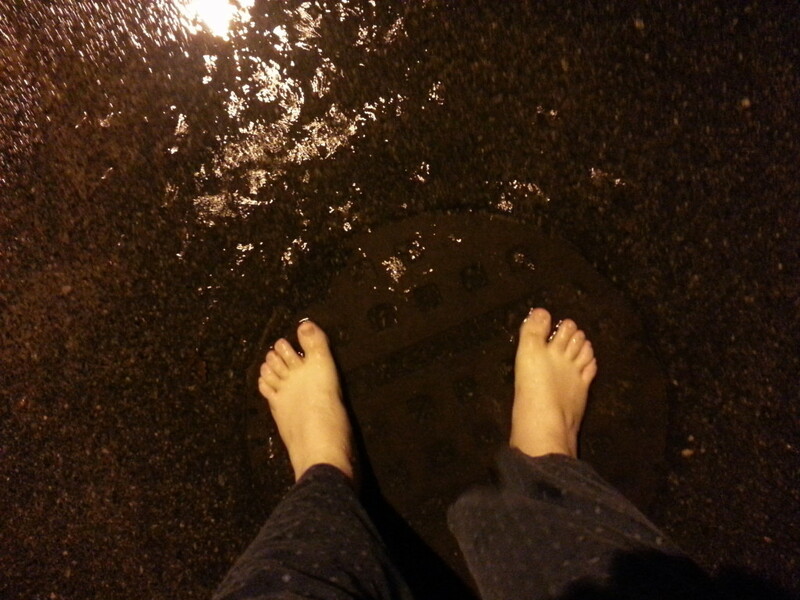 This is oddly dangerous ground for me. Because, the truth is, every year before we launch our big End of Year fundraiser, I worry about Worldbuilders. 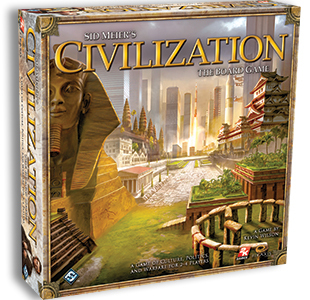 You see, I always want Worldbuilders to be better than the year before. I want us to be bigger, raising more money, working with more people, doing new and exciting things. I want us to continue growing and being a force for good in the world. But on the other hand, I know the key to happiness is reasonable expectations. 2014 was our first million-dollar year. It’ a level of success that would’ve seemed unattainable to me a couple years ago. So for me to demand we do even *better* than that… it seems somehow arrogant, if not just downright silly. This is a constant dance I do mentally, I want the charity to be awesome, but I also want to be emotionally healthy. 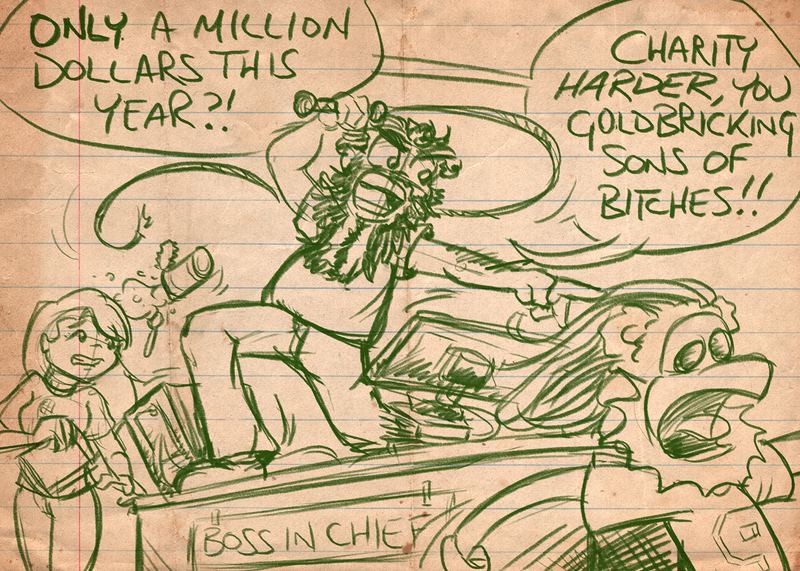 What’s more, I want to be a good boss, and reasonable expectations are a huge part of that. How awful would it be if we ran a fundraiser, made a million dollars, and felt like we’d failed? 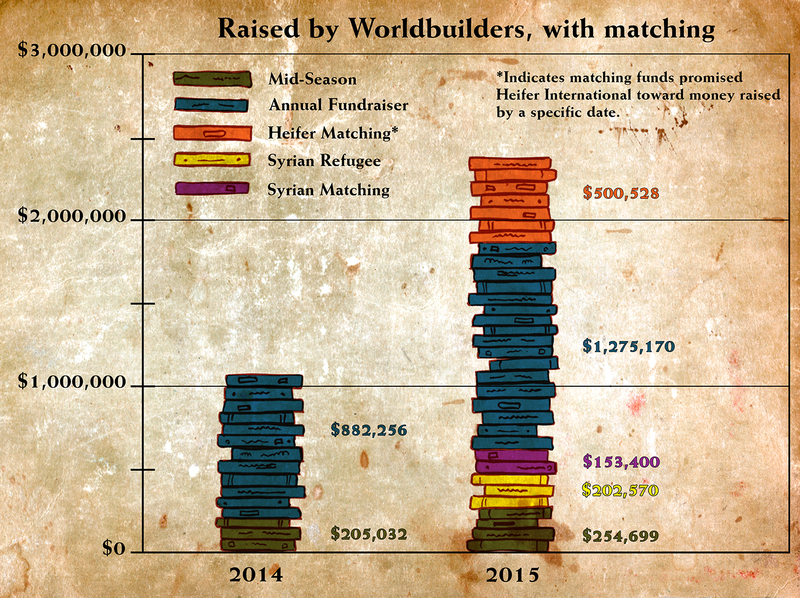 The truth is, Worldbuilders raised a million dollars in 2014. And if we never, ever got bigger than that, we would still be an awesome charity. 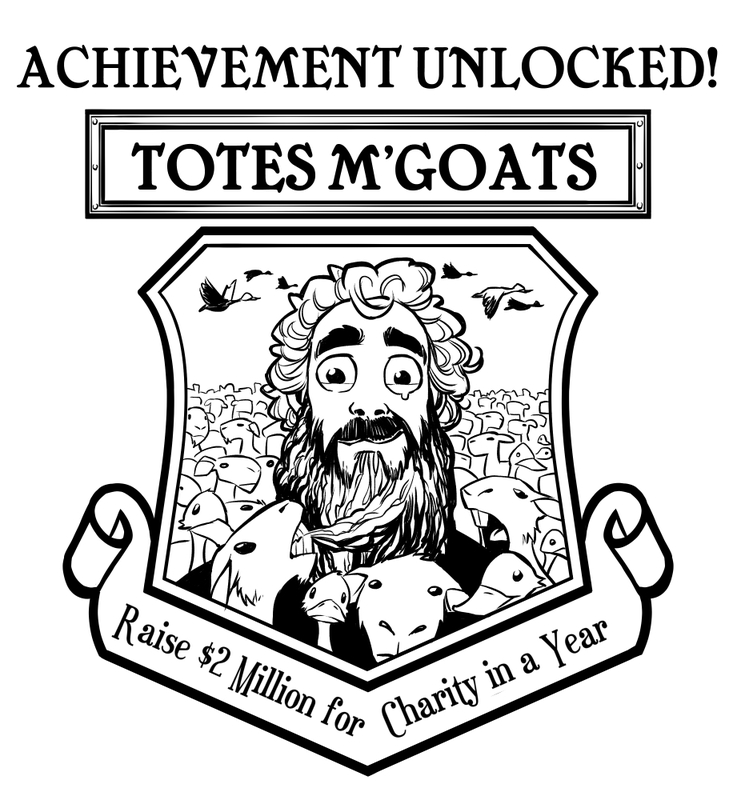 That said, in 2015 we *did* raise more than two million dollars. 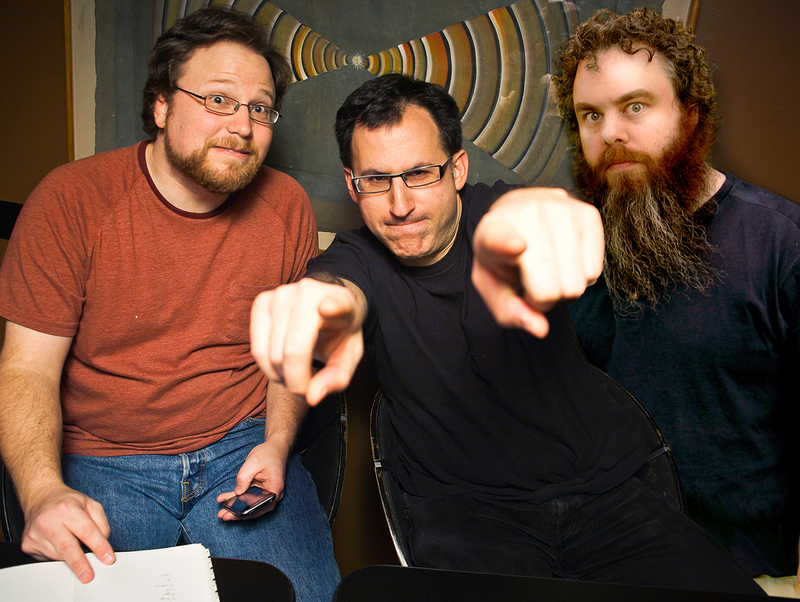 This is counting the our mid-season Geeks Doing Good campaign on Indiegogo. 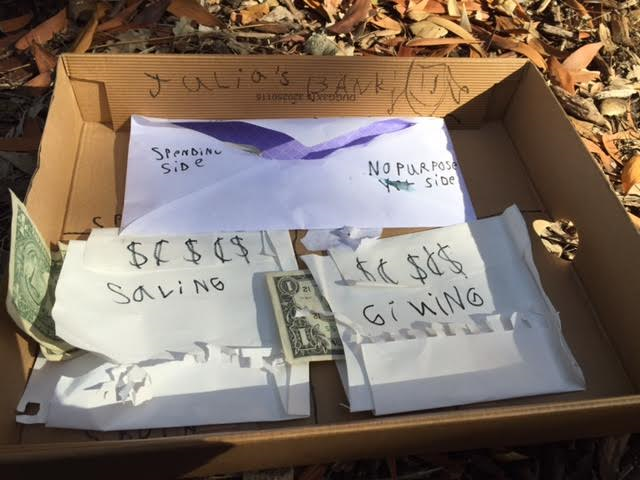 And our completely-impromptu fundraiser for the Syrian Refugees. We had a huge outpouring of support from the community that caused both of those to be delightful successes. So, let’s look at some graphs. Because as much as I love the words, sometimes it’s easier to grok this stuff graphically. That’s almost a mind-numbing amount of money. Because of it, villages will get clean and reliable water for the first time. There will be a ton of fruit trees planted, to increase air quality and provide healthy food. Parents will be able to feed their kids milk and eggs. Families will be able to generate income that will give them control over their own lives, letting them have better homes, education for their children, and a brighter future. This also shows very visibly that y’all are willing to come along with us to support other worthwhile causes like helping with the Syrian refugees. But that’s not the only cool thing going on. Check this out. This is a really cool piece of data for me. It means people who donated $60 or less made up 22% of our total for our big End of Year fundraiser. Every year I hear people say, “I was only able to give $20….” as if they felt guilty about it. As if they weren’t *really* helping. So check out that graph. That proves what I say every year. There really aren’t any small donations. And it’s by working together that we are mighty. If you’re one of the folks who helped out with 20 or 30 bucks, I want you to know that together with your brethren and sistren, it added up to a huge piece of money. 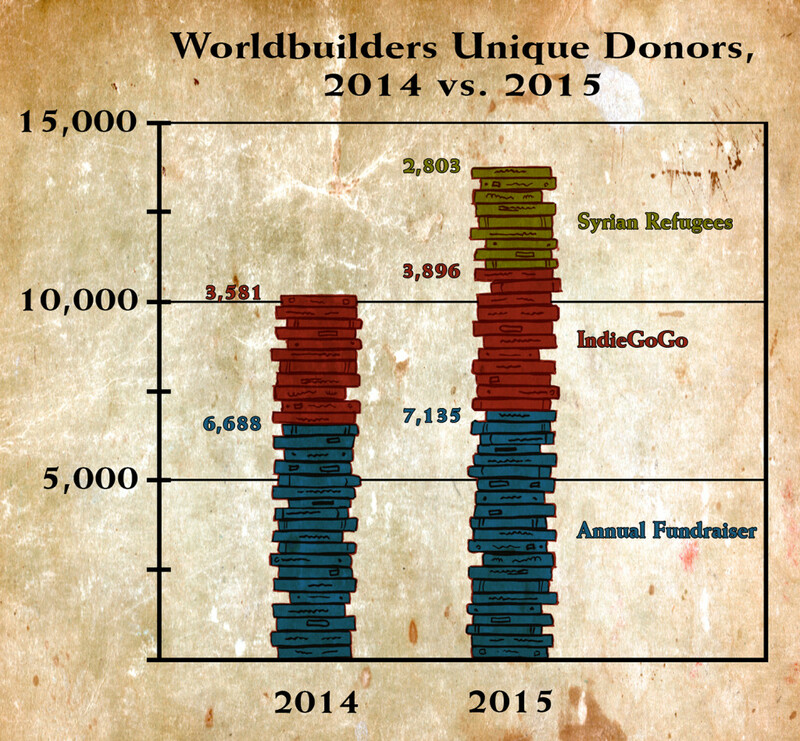 There were 3,824 new donors this year who have never participated in Worldbuilders before. 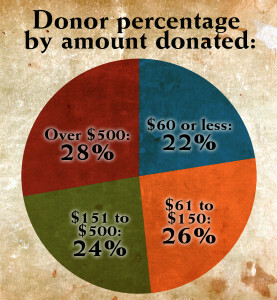 Considering we had 7100 unique donors, that’s a RIDICULOUS number of new donors. 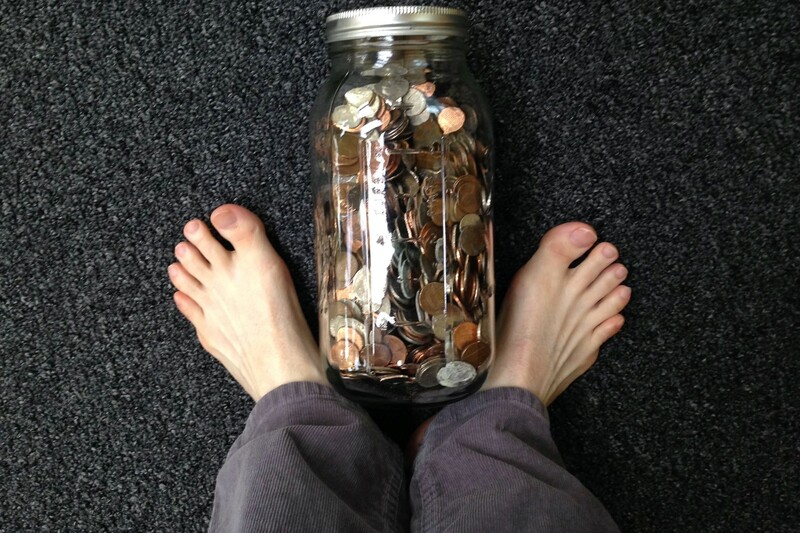 More than half of you stepped up and participated even though you’d never done so before. 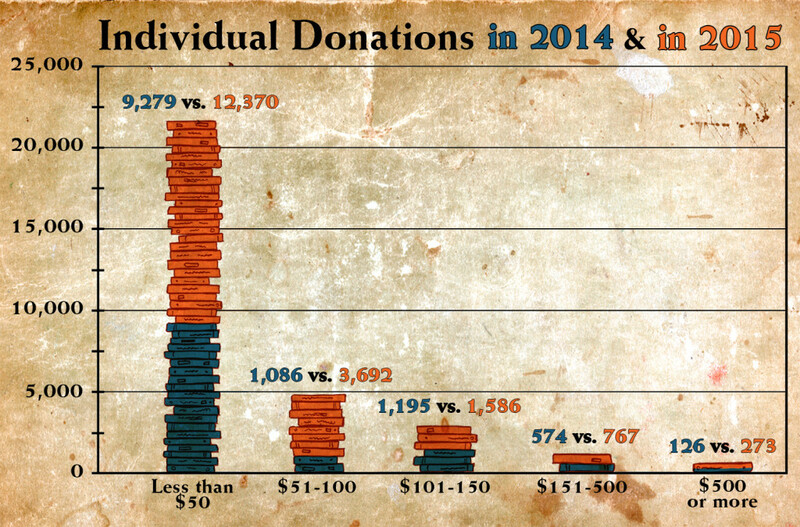 Across all fundraisers, we had almost 14,000 unique donors. We are growing every year thanks to you guys. This was the first year we shipped prizes in January. We also finished shipping prizes last week, which is by far the fastest we’ve gotten prizes out. It’s almost like we’re getting better at this stuff. On that note, we’re already looking toward the future. 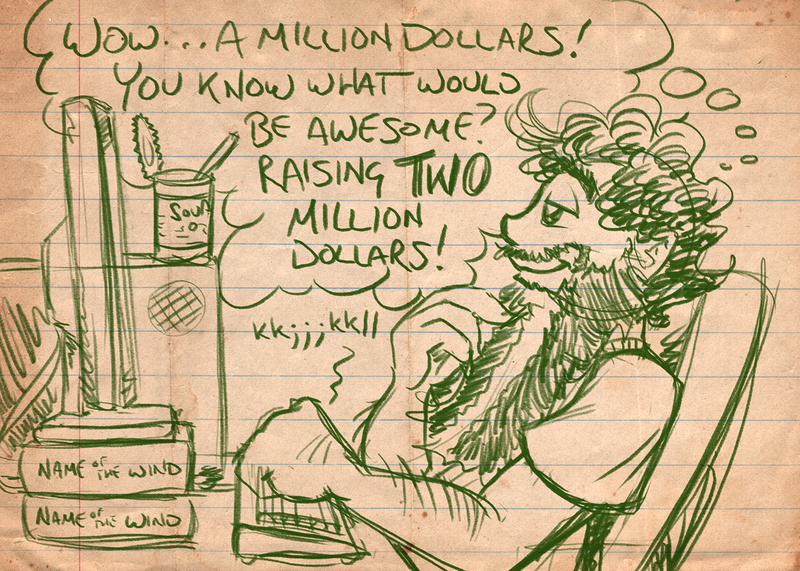 We’re constantly trying to improve the fundraiser, deciding where to devote our energies. To do a good job at that, we need as much data as we can get. We’d like to know what you like about the fundraiser, how you’ve participated, and what you think about some ideas we have for the future. If you’re willing to help us out, the survey is right here. It won’t take too long, and it’ll do a lot of good in terms of helping us make good plans so we can keep growing in the right direction. Thanks everyone. You warm my bitter old heart. 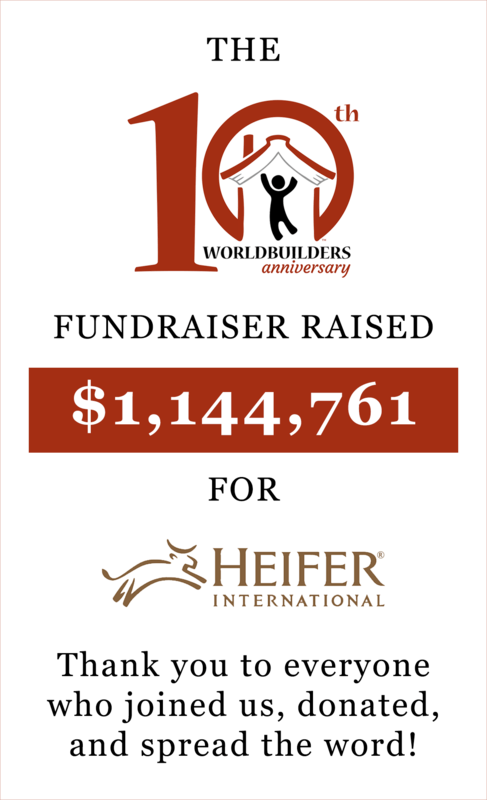 One of the great things about Heifer International is that they work hard to partner with groups local to the areas they’re working in. 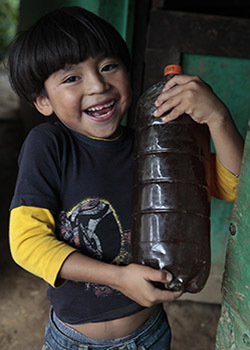 For example, in Guatemala they partnered with Green Mountain Coffee to help support families who were building sustainable, self-reliant coffee farms. And the best way to do that was to provide honey bees to pollinate the coffee, as well as to produce delicious, sellable honey. There are a fair number of small-scale coffee farmers in Guatemala, but the harvest season is only 4 months, so they often have no income for the remainder of the year. This was Feliciana Martin’s biggest concern before Heifer gifted her some beehives, but she doesn’t have that worry any longer. She collected 60 pounds of honey in the first six months and doubled the number of hives she owns. In addition to a sizeable increase in the yield of her coffee farm, which was struggling to support her and her daughter, she now has income from the honey to help pay for food, school, and medicine for her family. Then she trained some neighbors on the proper care of bees and gave them hives to start them on their own road to increased independence. This is called “Passing on the Gift.” All Heifer recipients take part it, and it’s a big piece of what makes Heifer’s work so successful. Martin dreams of a better life for her daughter. Now she can make that happen. 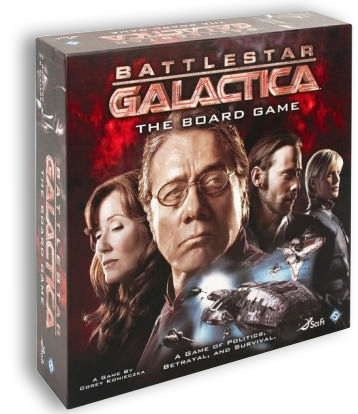 As an added bonus to helping a family make a better life, $30 also gets you 3 chances to win one of the fabulous books or games in our lottery. 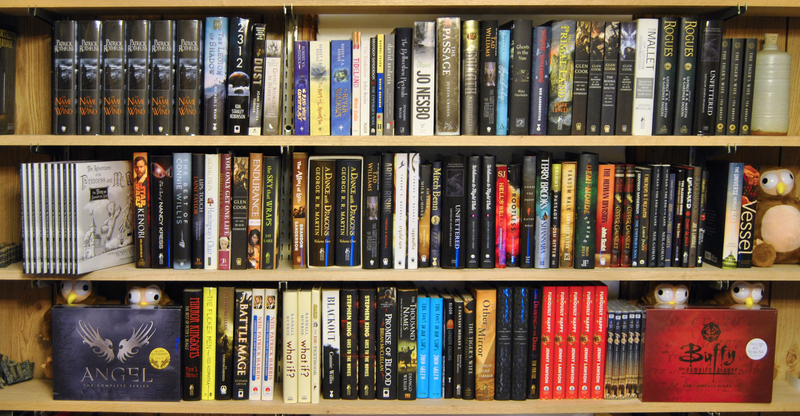 We’ve amassed a staggering number of both via private donations, author donations, and donations from our lovely sponsors. 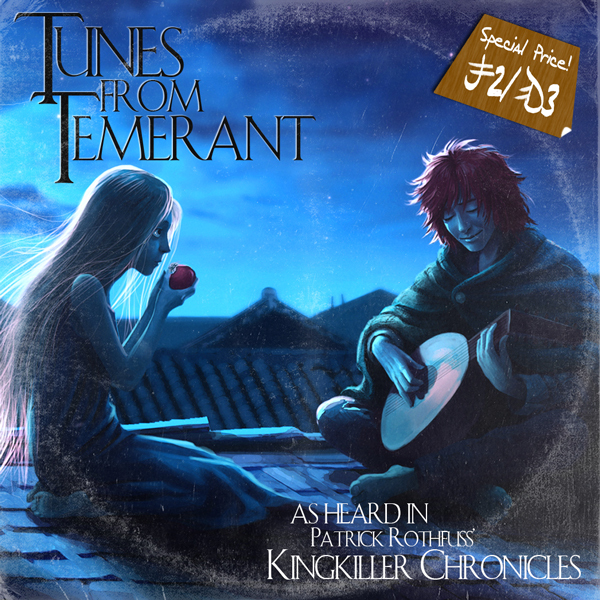 This time around, we have a few things from DreamHaven Books in Minneapolis. DreamHaven is a wonderful bookstore, and a small press as well. 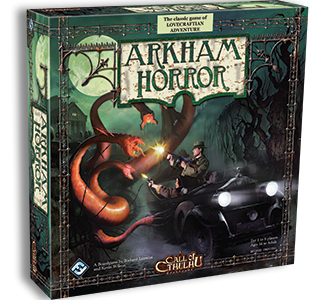 We’ve got a cool mix of books produced and published by DreamHaven, as well as some of the rare or limited books they’ve come across over the years. 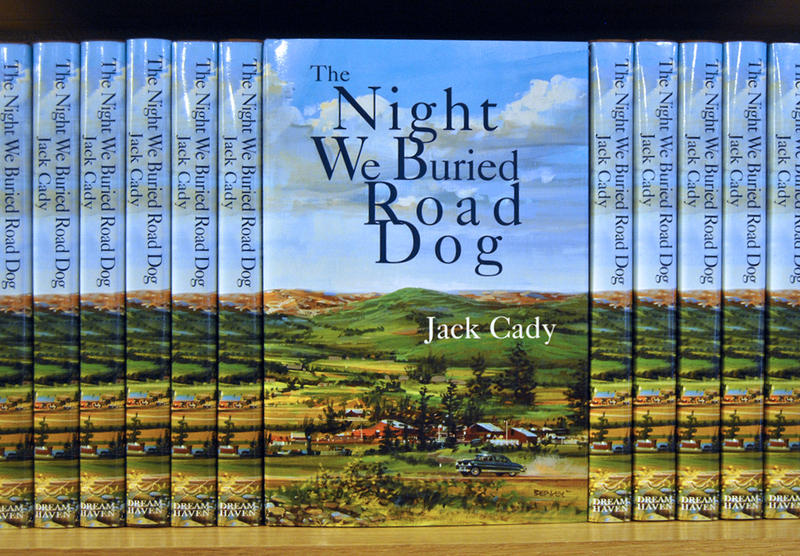 28 first edition copies of The Night We Buried Road Dog by Jack Cady. 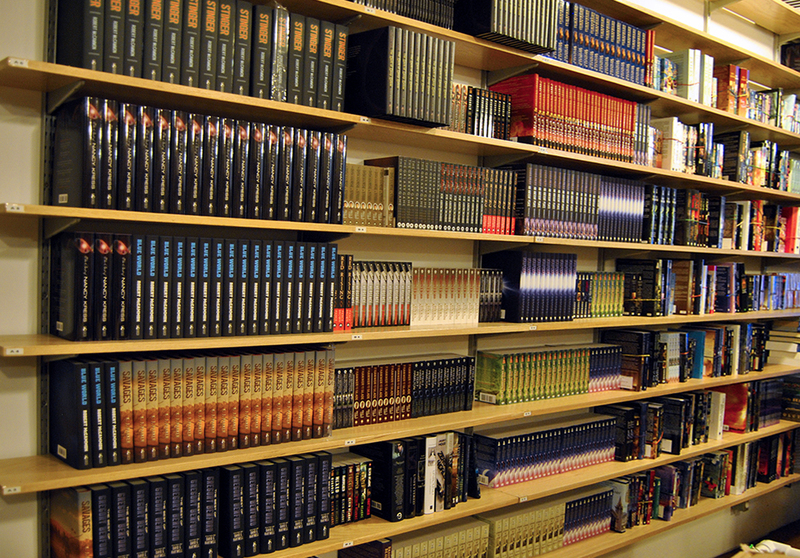 Greg, the owner of Dreamhaven, discovered a box full of first edition copies, and sent them all along to us. 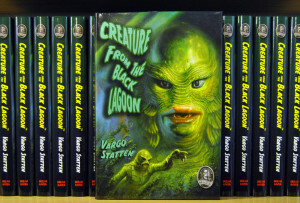 28 first edition copies of The Creature from the Black Lagoon by Vargo Statten. 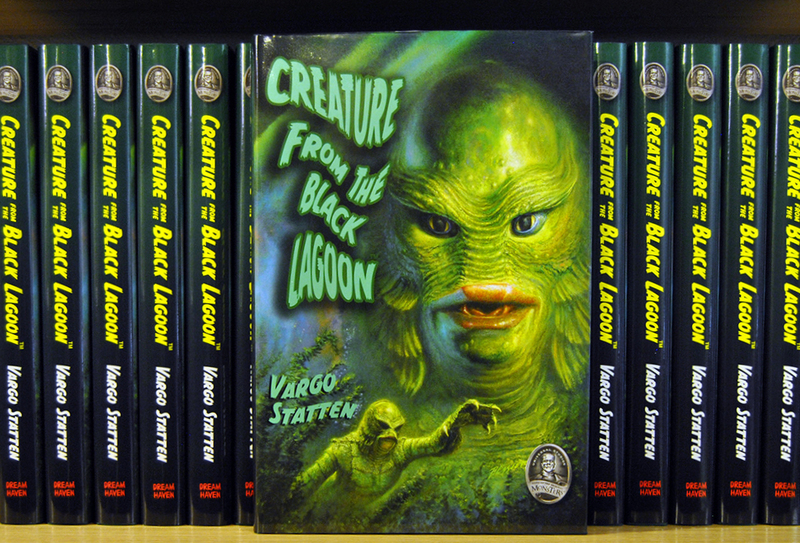 This is the novelization of the creepy classic movie, and it features a lot of stills from the film in addition to the novel itself. 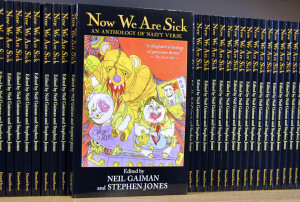 80 copies of Now We Are Sick: An Anthology of Nasty Verse, edited by Stephen Jones and Neil Gaiman. 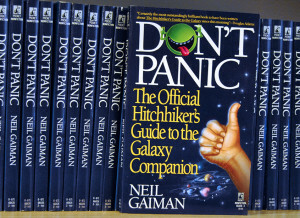 Anything Neil Gaiman works on is good – that’s an empirical fact. 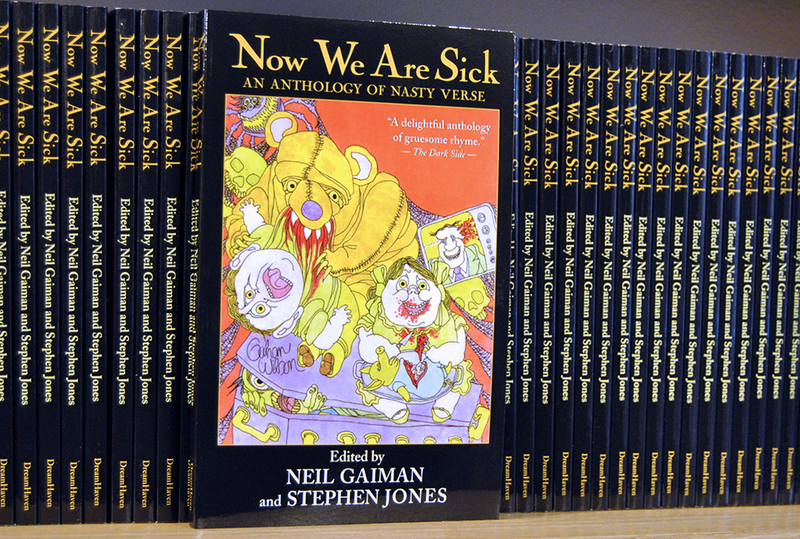 He helped edit this collection of poems that are both funny and gruesome, so there’s no way you won’t love it. Every $10 donation gets you a chance to make this book part of your collection. 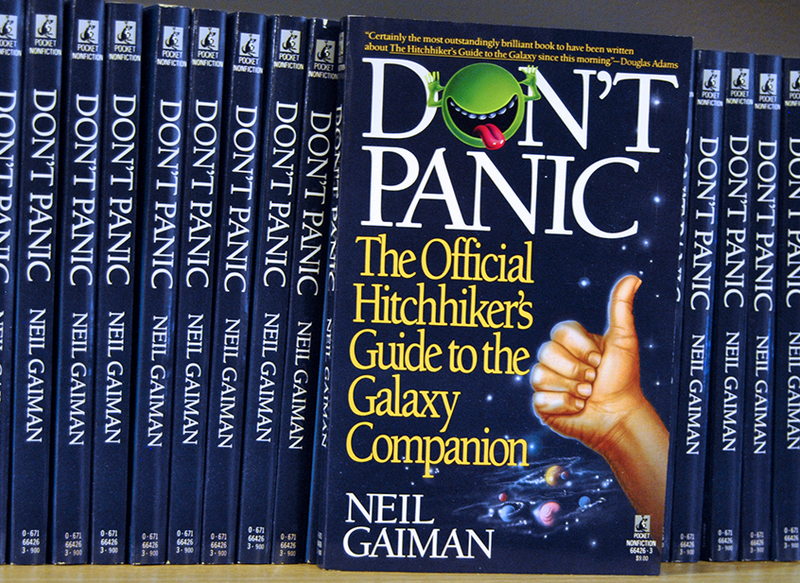 48 copies of Don’t Panic: The Official Hitchhiker’s Guide to the Galaxy Companion by Neil Gaiman. A lot of people don’t realize that before Gaiman did fiction, he was a journalist. And this is one of his earliest books – published in 1988, it was his second book, after, I am not joking, a Duran Duran biography. 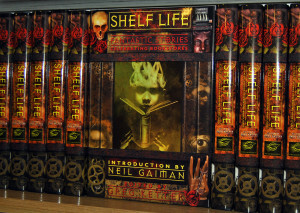 22 first edition copies of Shelf Life, Edited by Greg Ketter. 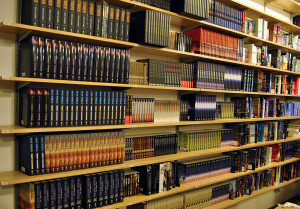 Greg is the owner of DreamHaven, and he’s put together a collection of stories about bookstores. 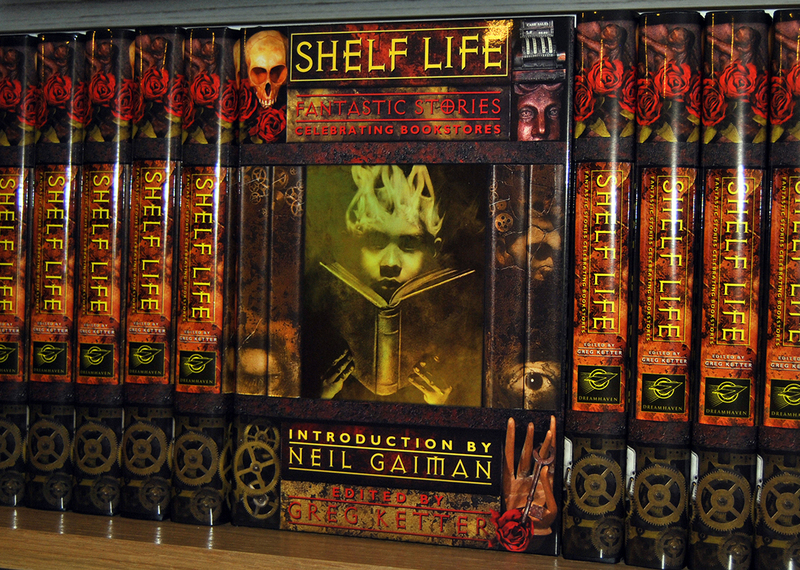 This is the original hardcover printing with 5 bookstore-centered stories, and an introduction by Neil Gaiman. It’s something that’s close to all of our hearts, I’d guess, and 22 of them have been put into the lottery. The finish line is in sight, folks. We’ve rounded the corner, and are on the straightaway. All of our auctions are ending Sunday night, so if you’ve been waiting to snipe something, now’s the time. There won’t be any more added before the fundraiser is over. If you want to get an entry (or 3) into the lottery, you get one for every $10 you donate on our fundraising page. $30 get you three entries in the lottery and a family gets honey bees. $60 is enough to buy a family fruit trees, plus you get six entries in the lottery. 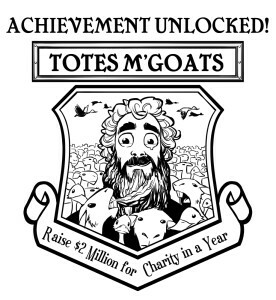 $120 gets you twelven entries and one of my favorite donations: a goat. 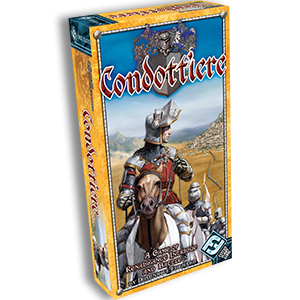 And there’s only a few more days you can get something from The Tinker’s Packs and be sure it’ll arrive in time for Christmas. We have books, games, t-shirts, scarves, and even a stuffed owlbear, all of which could make someone very happy as a holiday gift. Enjoy your weekend, folks. And keep spreading the word. We can’t do this without you. 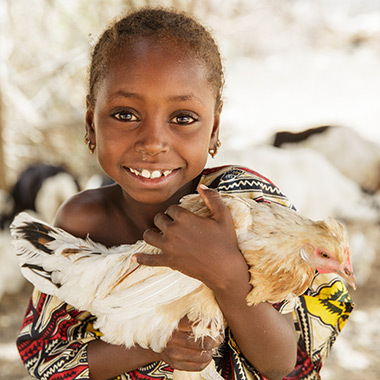 One of the Worldbuilders Team’s favorite gifts you can buy from Heifer is chickens. In some ways, it’s an obvious choice. Chickens produce eggs, and eggs produce chickens. In parts of the world where poverty is high and meat is scarce, protein-packed eggs from even a single chicken can have a huge impact on a child’s nutrition. A good hen can lay between 200 and 300 eggs a year – that means a flock provides enough eggs for an entire family to eat, with plenty left to sell. Twenty bucks is enough for a starter flock of 10 to 50 chickens. But the families don’t just get those chickens. They get the training and materials they’ll need to care for those chickens for a long time. Best of all, chickens are a good form of pest control, eating insects that damage crops. They scratch and peck at the soil, eating weed seeds and giving themselves dust baths to get rid of mites all on their own. 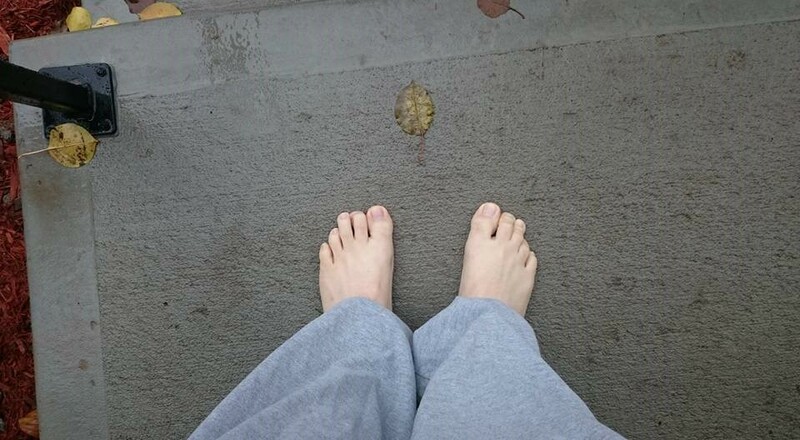 Their droppings fertilize gardens. 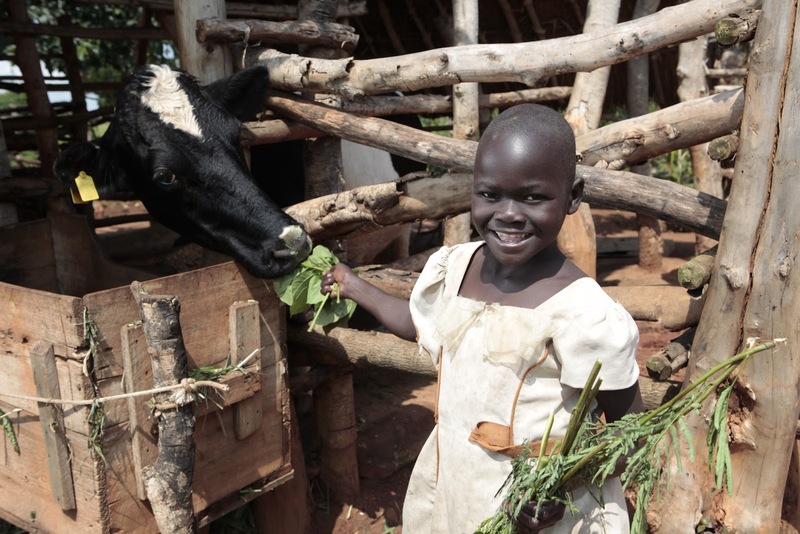 Heifer also trains the people they work with to Pass On The Gift to their neighbors. 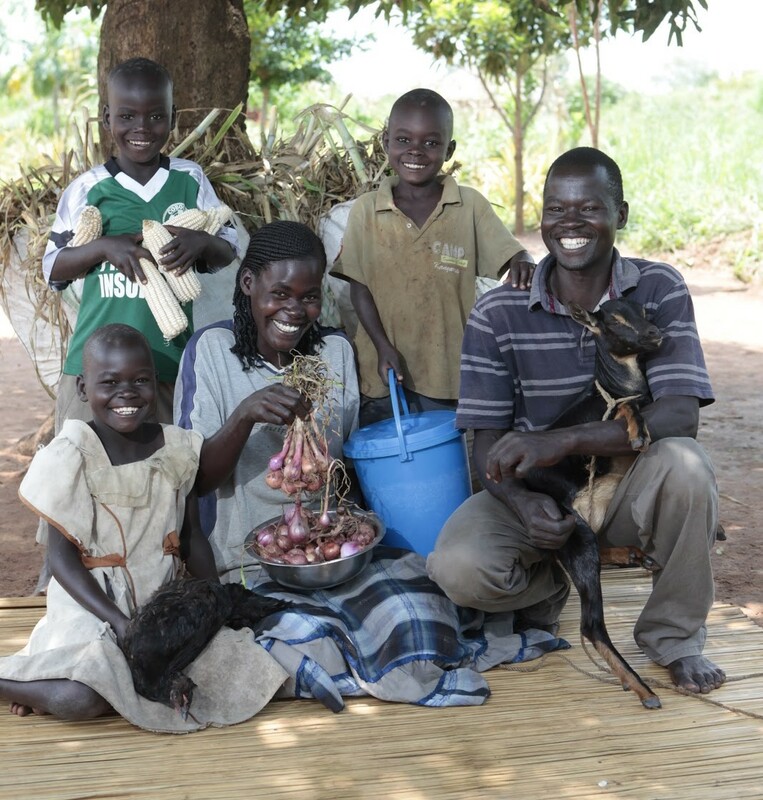 That means after receiving help from Heifer, a family will go on to help others, sharing baby chicks and training members of their community. This means a donation to Heifer is like kicking off an avalanche of good that cascades into the future. For example, in 1952 Heifer provided 70,000 hatching eggs to people in Korea after the country was devastated by war. Twenty years later, the Korean Ministry of Agriculture estimated that half the chickens in Korea were descended from the eggs Heifer supplied. That’s how Heifer International works. That’s why it’s our charity of choice. Today, we present to you a little bit of everything. 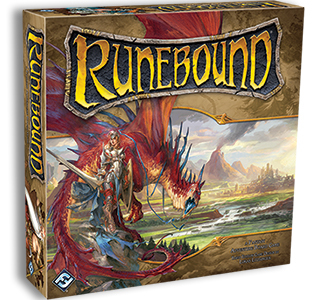 It’s the last week of the fundraiser, and that means that some varied donations have been coming in here and there, and we’ve put a hodgepodge of them together for you. Auction: Peter Orullian will kill you in his upcoming book and let you choose your last words. We had a bunch of tuckerizations go by a while ago, but Peter was kind enough to step up and offer one, too. He’s offering to fashion a character after you, in both name and likeness, then have them die a spectacular death. He’ll work with you on what your character’s final words will be, so you’ll get to say whatever you want (within reason). 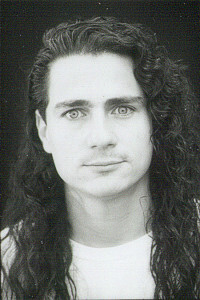 You know you want this power. You can bid on it right here. Literary Posters from Book Rapport. One full set of 53 posters in the lottery, another up for auction. These posters are designed by Steve Shell, an English and Theatre teacher from North Carolina. Each print features a period map of the setting of the text, with a cutout of an iconic image or shape from the story that shows a selection of text from the novel/poem/story. Steve was kind enough to donate a couple of sets, which is a total of 53 posters, and Amanda is kind of desperate for them. 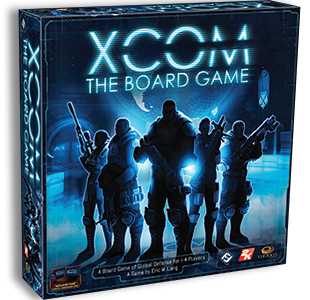 We put one set in the lottery, and the other is up for auction right here. 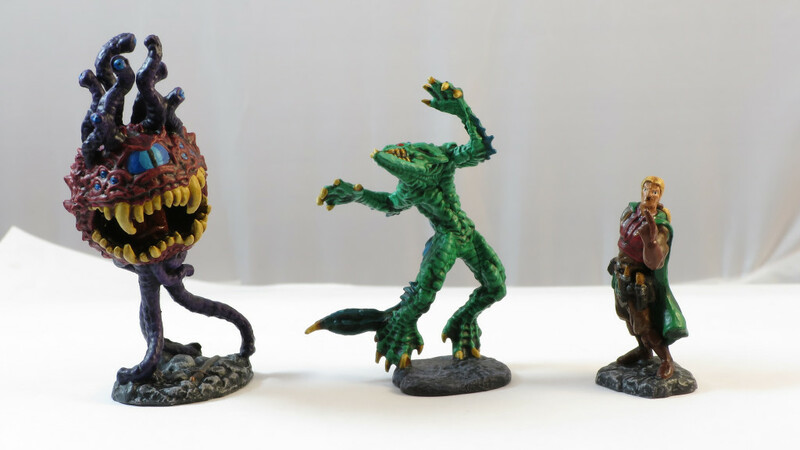 Auction: 3 Miniatures painted by Django Wexler specifically for Worldbuilders. 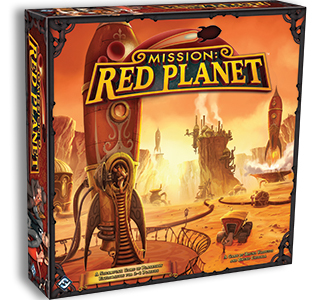 Django Wexler was kind enough to offer to paint miniatures for us as a stretch goal for this year’s fundraiser. He sat down, stuck his hand in his box of minis waiting to be painted, and pulled three random ones out. He painted them all (very well, I might add), sent us the video, and we’re now auctioning those very minis off for Worldbuilders. If you want to grab them, you can bid on them right here. Auctions: Two many-pocketed cloaks, one large sized and one medium sized, handmade by Kirkii Creations. 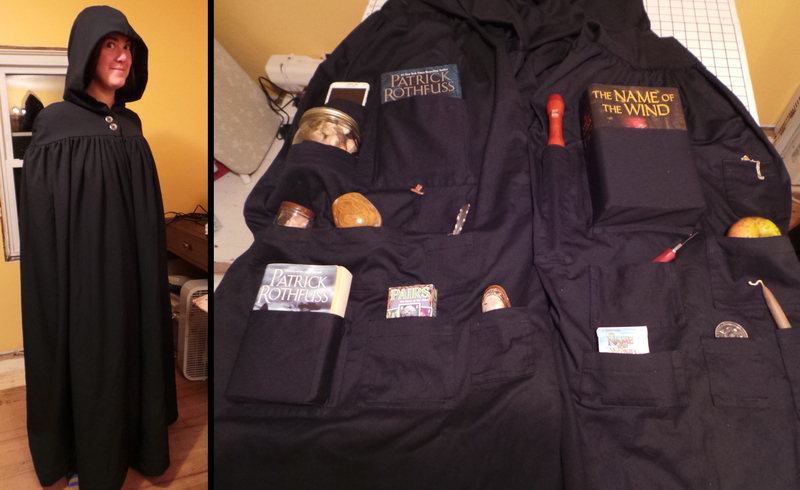 This year’s donations included two cloaks, each with 18 different pockets in a variety of sizes. They’re made of wool with a cotton lining, making them very practical for cool or rainy weather. We were all so happy to see them come in, and we really hope they each go to a home where someone will love them, and fill the pockets with all sorts of interesting things. There’s one that’s just shy of 60 inches long, which you can bid on right here, and the other is just over 55 inches long, and you can bid on it here. Auctions: Handmade geekry from Feathers and Fantasy: Baby Taggies, A Dragon Table Runner with Doctor Who Mug Rug, A Doctor Who Infinity Scarf, and 3 Geeky Throw Pillows. The baby taggies baffled most of the office, especially Amanda, but Mindy offered some insight: they’re made of soft fabric, and have little loops of ribbon along the edges for babies to grab onto and play with, to help with developing motor skills. As an added bonus, these are Star Trek and Firefly themed, so your baby will get an early start in their geeky career. You can bid on them right here. Then there’s a beautiful dragon table runner, inspired by Game of Thrones, with a Doctor Who mug rug. You can bid on those right here. And, if you’re already on a Doctor Who kick, the infinity scarf is an excellent stealth geek item, with beautiful blue fabric and an occasional sneaky TARDIS. You can bid on that one here. 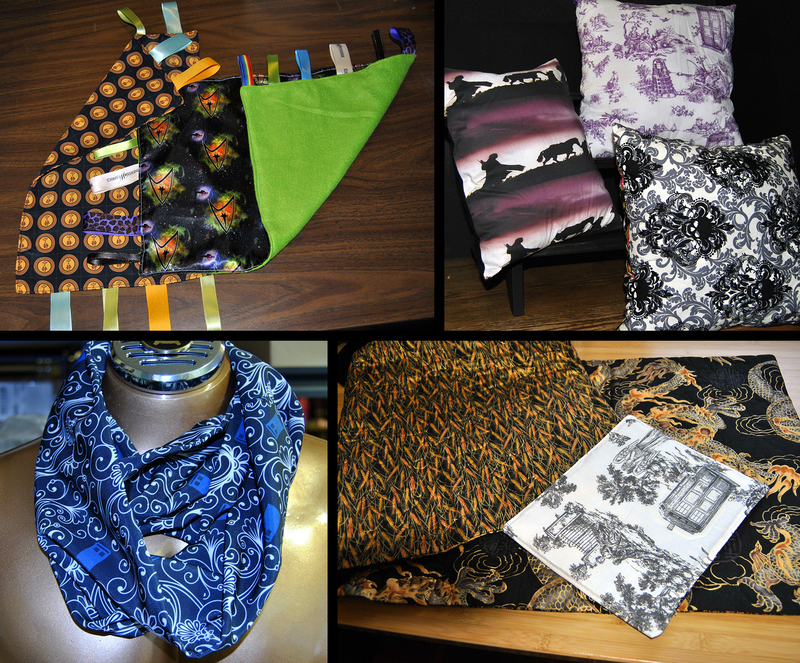 And finally, a set of three geeky throw pillows, featuring designs from Doctor Who, The Hobbit, and some skull art, just for kicks. If you need more pillows for your fort, you can bid on them right here. 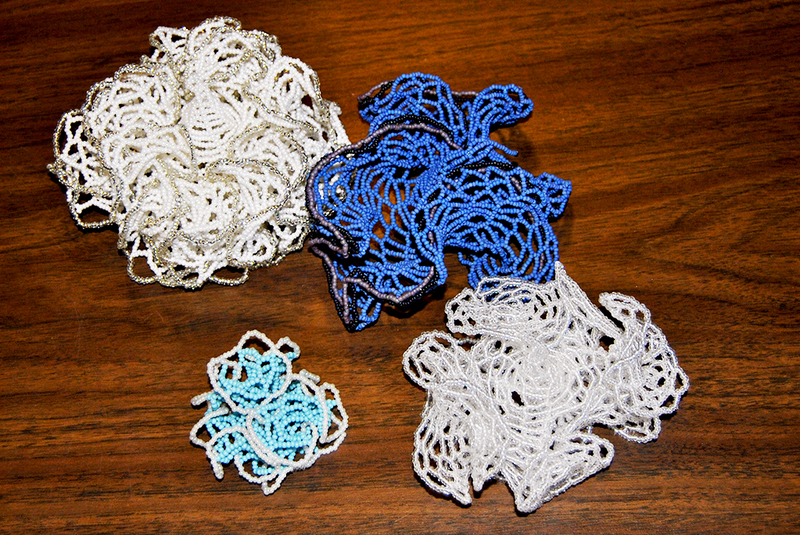 Auction: Four handmade beaded sea creatures from Vonda McIntyre. Vonda McIntyre’s hobby is pretty intense. When she’s not writing, she works very hard to make beaded sea creatures like anemones, jellyfish, nudibranchs, and marine flatworms, then features them in art installations, including the actual Smithsonian. 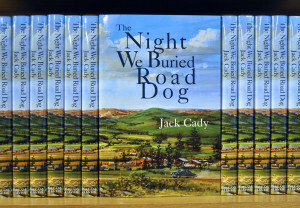 They’re incredibly time intensive, and she was kind enough to send us a set of 4 to auction off for the fundraiser. If you want these beautiful things, you can bid right here. Auctions: Tektite pendant necklaces, one with a silver chain, and another with a gold chain. Designed exclusively for Worldbuilders by Marion Anderson. Marion Anderson is a paleontologist and planetary geologist. She knows a thing or two about stone and rock. She made necklaces out garnet, lapis lazuli, and tektite. Tektites are formed in meteorite impacts, when the high speed of the meteorite is converted to heat and pressure when it hits the Earth. Rocks melt, and as they splatter around they cool, forming the tektites (or “impact glass”). These particular tektites are made from an impact in Southeastern Asia about 400,000 years ago. There’s one available on a silver chain (pictured on the left) one available on a gold chain (on the right). You’ll have a cool story to share every time someone asks you about it, so to bid on the silver chained one, click here, and for the gold chained one, click here. Auctions: Lots and Lots of Jewelry from Serpent’s Dance Designs. 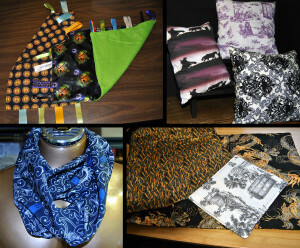 Amber from Serpent’s Dance Designs has been donating to the fundraiser for years, now. There have been necklaces, pendants, and pins for a long time, and this year she donated ten different pieces for us to auction off to whoever would love them. It should go without saying that these are all one-of-a-kind creations. But I’ll say it anyway: These are all one-of-a-kind creations. More pictures of each of these can be found if you follow the links below. Amber sent us some dragon themed pieces, in the form of shawl pins as well as a necklace. They’re lovingly hand-crafted, and here are the links (in order of the picture): The stamped, silver-accented shawl pin is up for auction right here, while the etched copper pin is up right here. The necklace has a small silver accent as well, and if you’re prepared for a potential bidding war with Rachel, you can bid on it right here. She also made a few different Kingkiller inspired necklaces. 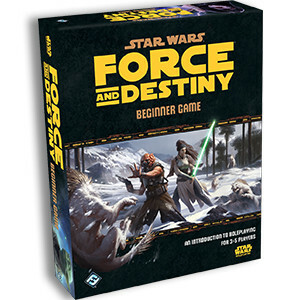 First was the “Practice Makes the Master” necklace, which is good stealth geek. I mean, you could be referencing anything. You can bid on that copper necklace here. Then there are two different copper necklaces that say “You may have heard of me.” The one in the center top photo has been polished, and has hammered edges. You can bid on that here, or you can bid on the stamped, distressed copper version from the bottom center photo right here. 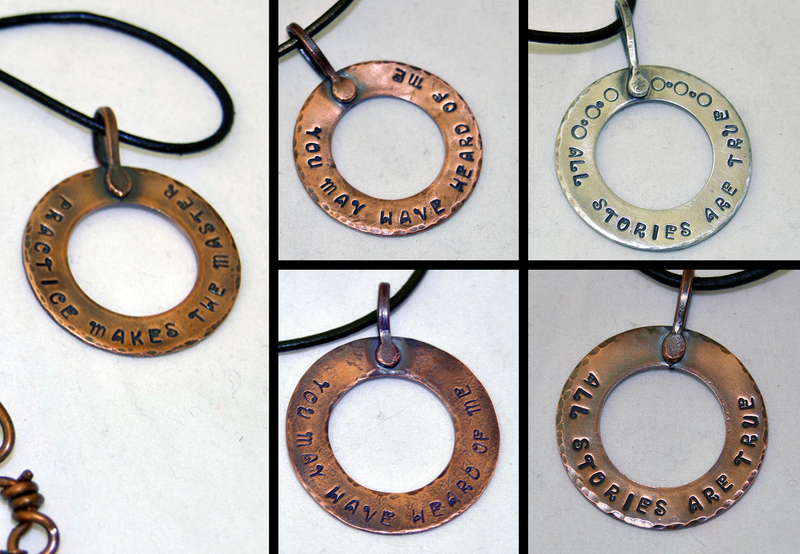 Then there’s the two different “All Stories are True” necklaces. The first one (pictured on top) is sterling silver, and up for bidding right here, and the second one is a stamped, hammered copper, up for bidding right here. The last couple were simply beautiful, elegant designs, one of a fairy and the other of a copper rose petal. 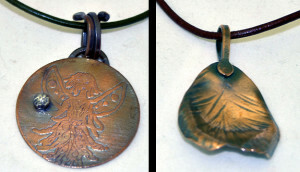 The first is a copper pendant with an etched fairy emblem. It’s really intricate, and even has a sterling silver accent. You can bid on it bid on it right here and wear it with pride if you win it. I made this piece in honor of my Mother, who passed away earlier this year. Her name meant “Joyous Rose” in Turkish. 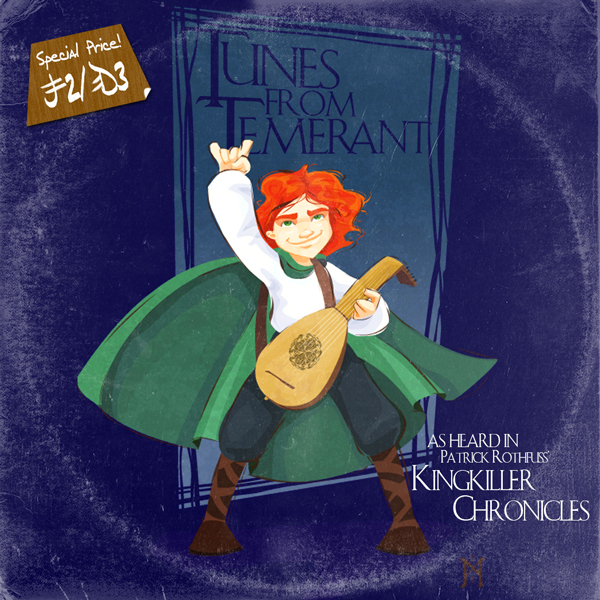 She was the one who encouraged me to get into metalsmithing, and she always enjoyed hearing about Worldbuilders and how it was progressing through the years. We’re really grateful to Amber for sharing her mother’s story with us, in addition to donating such beautiful jewelry. And we’re extra grateful to Amber’s mom for giving us a kind and talented metalsmith. You can bid on the copper rose petal right here. We hope the winner loves it deeply. There’s a lot of beautiful stuff here, so if you’re unsure, you can just go to our ebay page and look at everything that’s up for auction right now. You know, just to be sure you’re bidding on everything you might want. Don’t forget that there’s only a few days left to buy things in The Tinker’s Packs to have before Christmas. 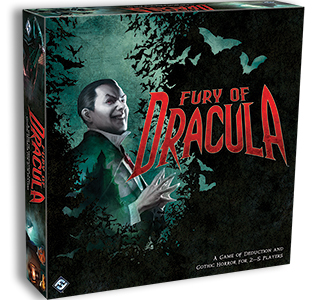 If there’s something you’ve had your eye on, now’s the time to bite. We still have a lot to show you, and only 5 days left to do so so be sure to check back….